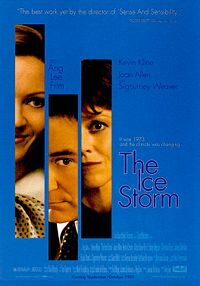 Hey do you guys remember that movie, The Ice storm? It was great, I mean I know it didn't do well in the box office, but I thought it was really poignant. Remember when the dad comes home, and no one even realizes he was gone? That scene really stuck with me. I remember when I first watched that movie. I was 18 and it was winter of 2000. Someone had rented the DVD. It was really cold and I remember my friends and I were all huddled up together under this ratty old blanket in the basement. I went upstairs to make some popcorn. None of the lights were on and there was only this cool gray light coming in from the blizzard outside. I heard a creak from the basement stairs and then I saw that this girl I had a crush on had followed me up. I was a little nervous. Neither of us were wearing shoes and I could feel the icy tile under my feet through my socks. We made small talk and hugged ourselves, shivering in the cold, listening to the rhythmic popping. We talked about the movie for a little bit and I remember I made some joke about how I thought it was going to be an action flick. As I went to go take the popcorn out, and she grabbed my arm and said “Wait. Just wait a second.” I never told her this, but that was my first kiss. Do you have any stories about the first time you watched The Ice Storm? Maybe you can just retell some stories from the film?